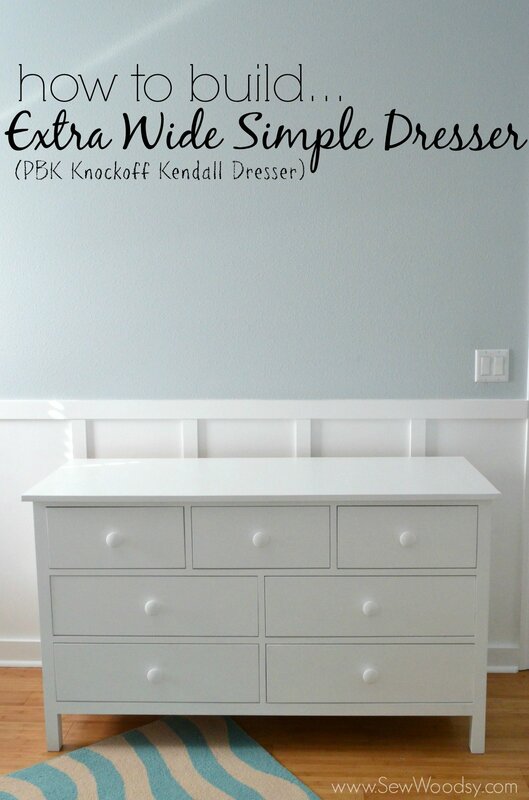 This post is brought to you by Minted. There are affiliate links in this post–that means if you click and buy something we receive a small percentage of the sale at no additional cost to you. As always, all opinions are our own. How is it that Christmas is only 8 weeks away? EIGHT! Sadly, we weren’t too active this Halloween season, so I’m making up for it in the Christmas department! 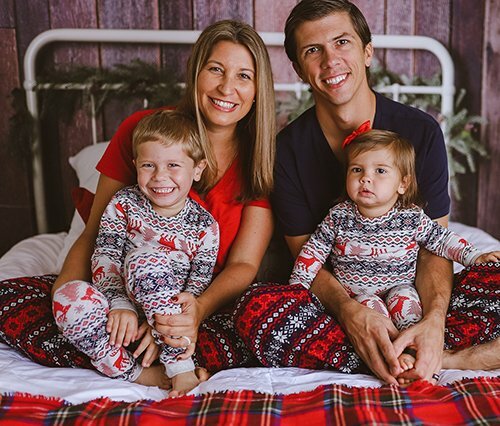 We just had our family holiday photos taken yesterday, so that means that I’m currently trying to decide between what style Christmas card I want to send out this year. 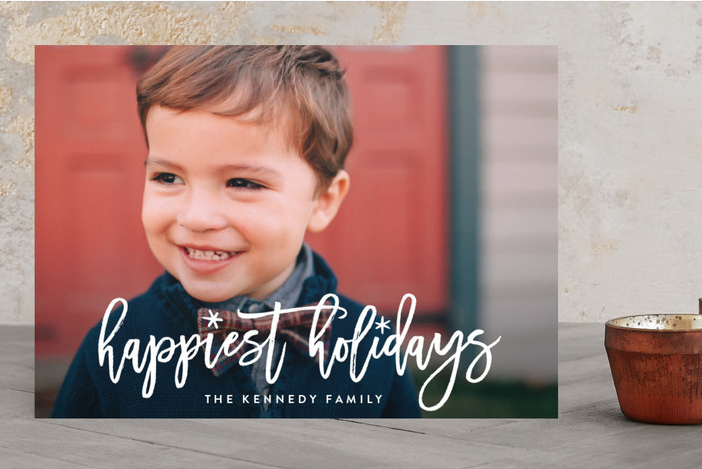 Once again, I’ve partnered with my friends at Minted for our holiday card needs. They are my absolute favorite stationary company. 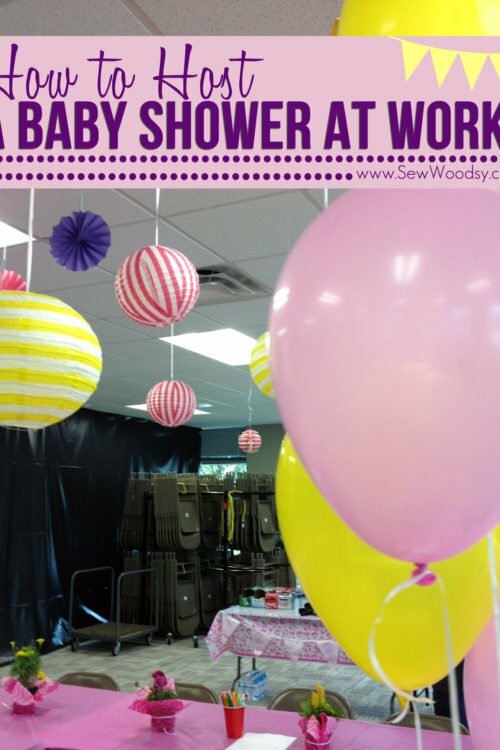 The quality far exceeds any other card company around. They are the only company I turn too! 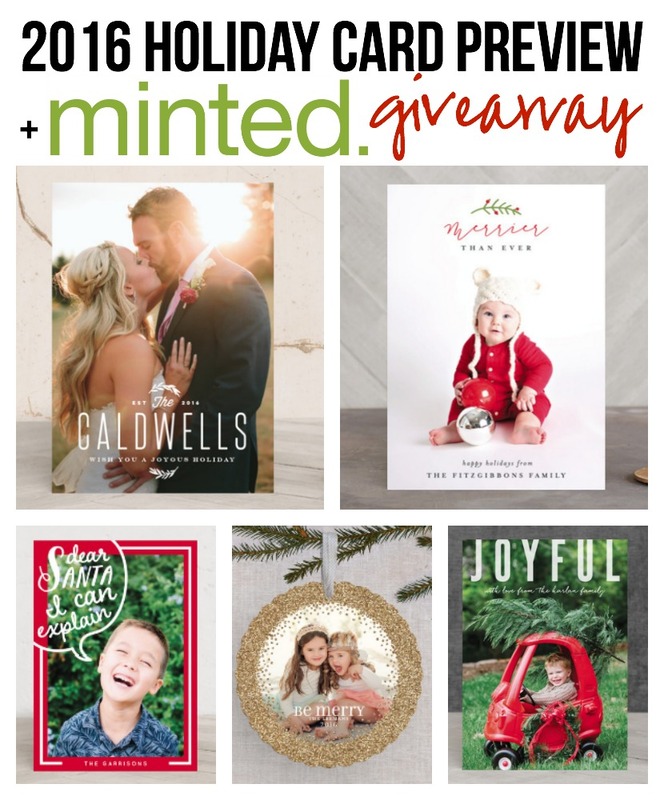 AND my friends at Minted are giving away THREE $100 credits. So make sure you scroll to the bottom to enter to win! I love this overview sheet they have on the website. 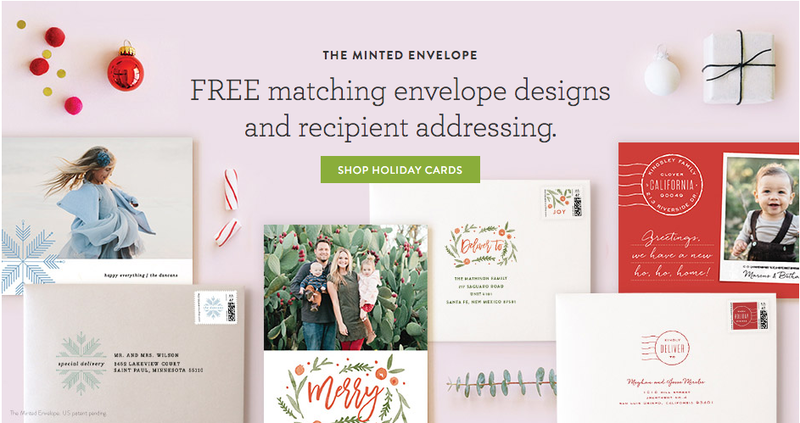 It breaks down all the different style cards you can get from Minted. Every year we always go with the 5×7; however, this year I’m leaning toward the folded 5×7. I’m in the mood to switch it up a little! And heck while I’m at it… maybe even add in a foil or letterpress. And of course every card comes with The Minted Envelope! It’s one of my favorite features that Minted offers and best of all it’s included in the price of your cards. You just upload a spreadsheet with the names and addresses of your recipients and Minted does the rest. They even coordinate it with the card design you choose! And now you can even get stamps to coordinate (or upload your favorite photo)! I’m pretty sure I’m going to take advantage of that service as well this year. To have it all delivered in one box, saves me a trip out! I’ll take it! 5×7 Cards, Starting at $1.65 per card. 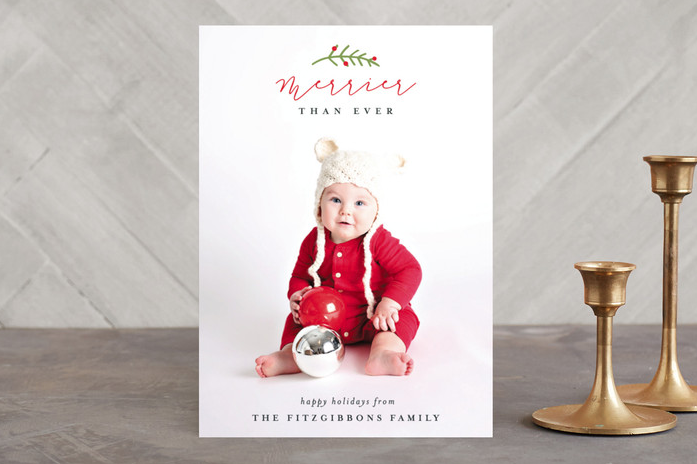 Minted’s famous original holiday card. Customize to make it your own. I’m loving the Fun Holiday Script Holiday Photo Cards this year. This card is definitely in the running if we go with the traditional 5×7 card. 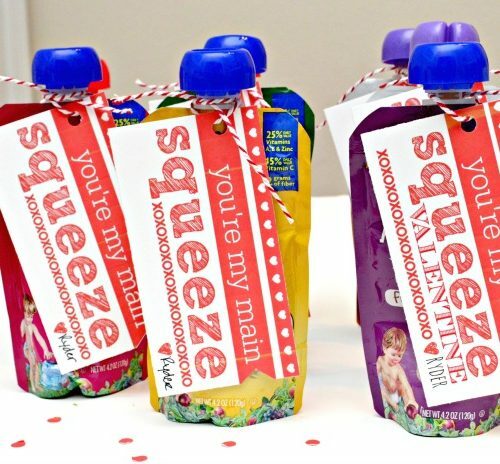 The best part is that you can customize it with a fun die-cut shape, add foil, change the color of the text, and decide whether or not you want a back with text and more images or just a design! Postcards, Starting at $1.15 per card. 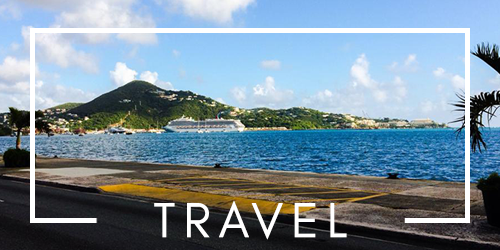 Save on postage and paper with a 4.25” x 6” postcard. No envelopes included. 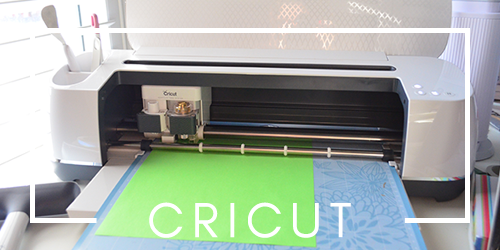 Available with standard and foil-pressed printing. 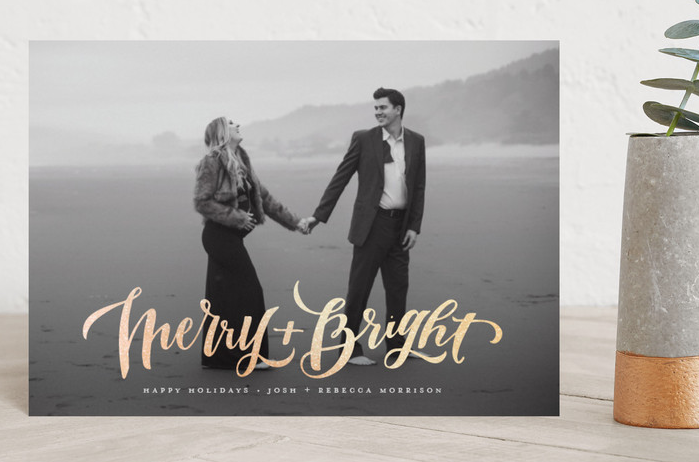 I love the Merry + Bright Foil-pressed Postcard! 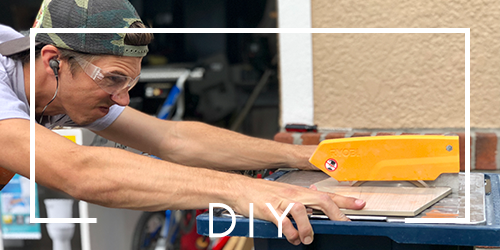 It’s a great option and less work for you to have to do when you get your cards. Just stamp and send! Folded Cards, Starting at $2.07 per card. Tell your story with our 2016 interior designs. 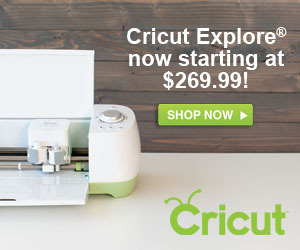 Available with standard, foil-pressed, and letterpress printing. 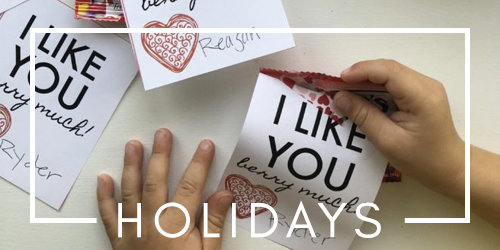 Loving the Merrier Than Ever Holiday Folded Photo Cards. This could be our Christmas card for sure this year. It says it all in just a few short words! And since we will have my bump in the photo it’s perfect! Ornament Cards, Starting at $2.12 per card. Send keepsake ornament cards that friends and family will cherish. Luxe linen ribbon included. I wish I could go this route. 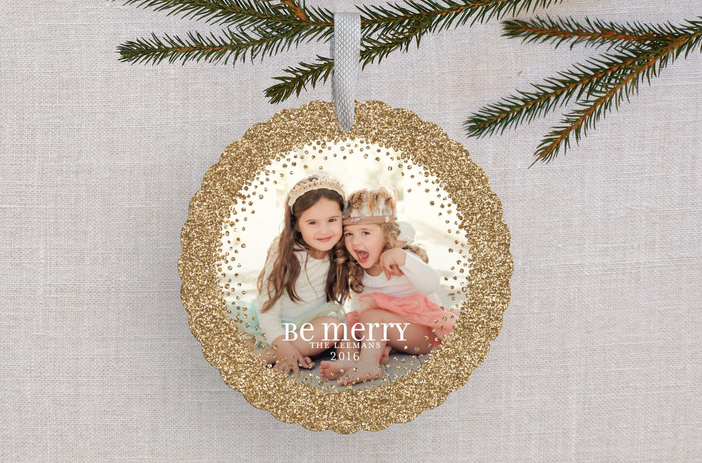 I love the Sparkling Be Merry Holiday Ornament Card! Maybe one year I will. I love the concept but I always love to include a little paragraph about our year! I love the practicality of the ornament card–your friends and family can hang it on their tree and use them for years to come! Booklette Cards – Starting at $2.28 per card. The modern annual newsletter–with chic rounded corners and 8 pages to share photos and memories. I can see us doing something like this in the near future once we have another bundle of joy to share the love with. Or once the kids are active in sports and other activities! I’m sure I’ll want to highlight it all with our friends and family that we sometimes don’t always get to see. So there you have it. A few of my favorite card designs and options from Minted. If your looking to get a jump start on your holiday cards starting Tuesday, November 8th all foil items are 20% off. 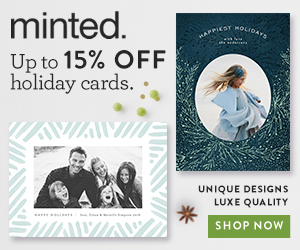 Minted also has a great sale on Holiday cards; 15% off orders of 150+ and 10% off order of 100+! 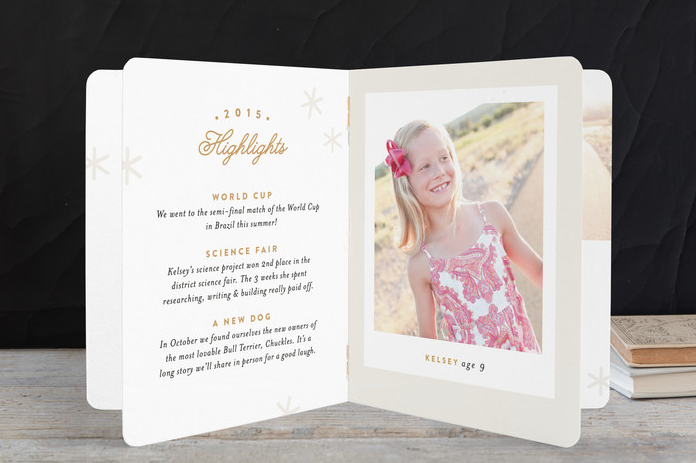 My friends at Minted want to give THREE readers $100 credits to design their own holiday cards! All you have to do is enter your email address HERE and they will contact the winners via email! Giveaway is valid from November 7th until November 14, 2016. Good luck!! !